Perched on the west-facing Jungutbatu beach, well-known for its world-class surf breaks and tropical sunsets, a luxurious new experience awaits the traveller in search of rest and 5-star relaxation on Nusa Lembongan Island. 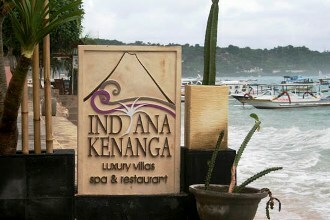 There are many beautiful spa resorts in Bali; now Nusa Lembongan Island has stepped up from her standard beachfront hotel reputation to introduce Indiana Kenanga villas, spa and restaurant. The ambience is Indonesian chic with a dash of European panache. The moment you step inside the open-plan retreat, expect to be greeted with a warm Balinese smile, the gentle waft of incense and the aromas of fine French cuisine. Here at Indiana, there are two superbly appointed villas and six private bungalows. The villas are pavilion-style layout with two large bedrooms, each with semi-outdoor ensuite. All rooms include a well-equipped kitchen and bar with a large lounging area for family or entertaining. A 10m pool surrounded by tranquil Balinese gardens with a huge sitting Buddha complements the open villa space, for that extra element of peace and harmony. The bungalows have their own private courtyard with striking outdoor furniture. Entry into the boudoir is like stepping inside a private healing retreat. Soft furnishings in shimmering metallic and shades of plum provide an instant calm to the senses. The bathrooms have an extra large bathing tub and separate semi-outdoor shower with a pebble-stone floor. 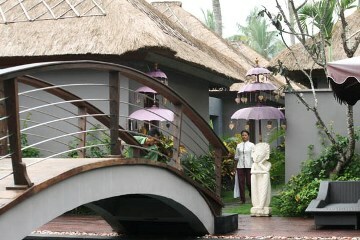 The front of the house, consisting of a dining area, bar, kitchen and reception office, is separated from the accommodation by a pool which spans the width of the complex, uniquely accessed by a garden bridge that is flanked by decorative Balinese payung (umbrellas). A few steps further and you are almost on the beachfront where the high tide laps serenely onto the retaining wall. Here in the front garden, you will find a small bungalow with a selection of gifts for sale including locally-made jewellery, hats, sarongs, and bikinis from the latest range exclusive to Indiana Kenanga. Wayan Kayan, Director of Indiana, is Balinese and along with his native Indonesian and English, can speak Italian and Spanish and French. There are 17 staff working here with all of them being born and bred on Nusa Lembongan. “We recruit and train our staff on-site. This way they are aware of the level of service that is expected of them,” explains Kayan. Fouquere Clément, a joint-owner of Indiana Kenanga, spent 13 years working in Michelin-starred restaurants in Scotland and Europe prior to finding his own slice of paradise here in Indonesia. Growing up in Lake Annecy-France, Clément travelled and worked around the world, most recently living in Tahiti. So how does Indiana Kenanga compare to the many places he’s lived in and travelled to in the past? “I have everything I need here — why would I want to leave?” Clément said.